Which Type of Chart Is the Best? Your choice of chart format is entirely up to you, although each has its uses. You may not like the candlestick format, but you should become familiar with it, because it by far the most popular type of chart you will see. It could put you at a disadvantage if your eye does not immediately adapt to it. In a way, your choice of chart reflects how much noise your eye can cope with. A line chart has no noise but a low level of information. A bar chart has detail but sometimes too much — it is noisy. Line charts contain the least detail, but by blocking out extraneous information, provide an instant sense of direction and slope (momentum) — or the absence of trendedness and momentum. Line charts can be misleading, though, because connecting just the closes withholds new highs and lows. 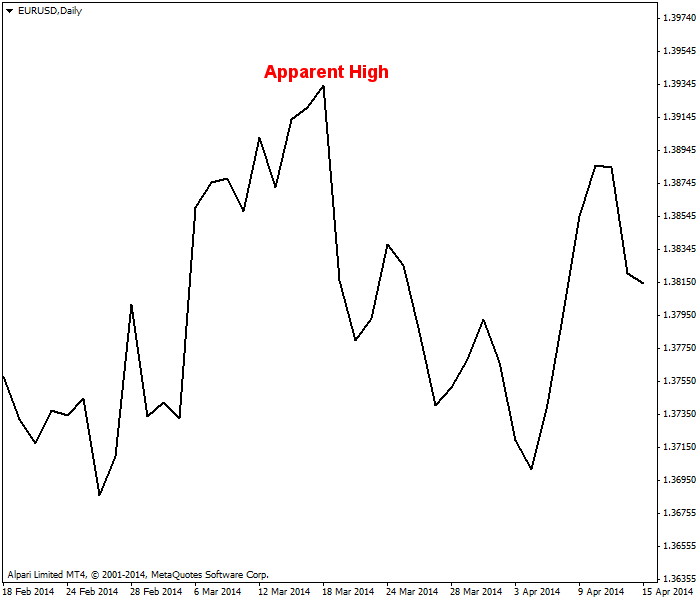 On the chart below, it looks like the high is on a specific date, whereas the highest high actually occurred a full five days earlier. You will probably be hard-pressed to deduce a buy/sell signal on a line chart. Line chart makes you think its highest high is there. The bar chart, containing all four components (open, high, low and close), gives more detail. Not only can you see the true location of the highest high, you can also see a series of lower lows. It is much easier to draw support and resistance lines on bar charts than on any other kind of chart. This is because support and resistance are drawn off highs and lows, while the line chart does not have them and the candlestick chart highlights opens and closes, not highs and lows. Bar chart shows you the true highest high and allows support line placement. The most eye-catching chart is the candlestick chart. On the example below, a very large black candle that closes lower than any close in over a week is immediately noticeable. You may consider it a “breakout candle,” even though that is not one of the conventional candlestick names. Also, on the right hand side of the chart, you can see the engulfing bull candlestick and that gives you one-day notice that the next candle will likely to white (higher high and close). An engulfing bull candlestick is a buy signal. 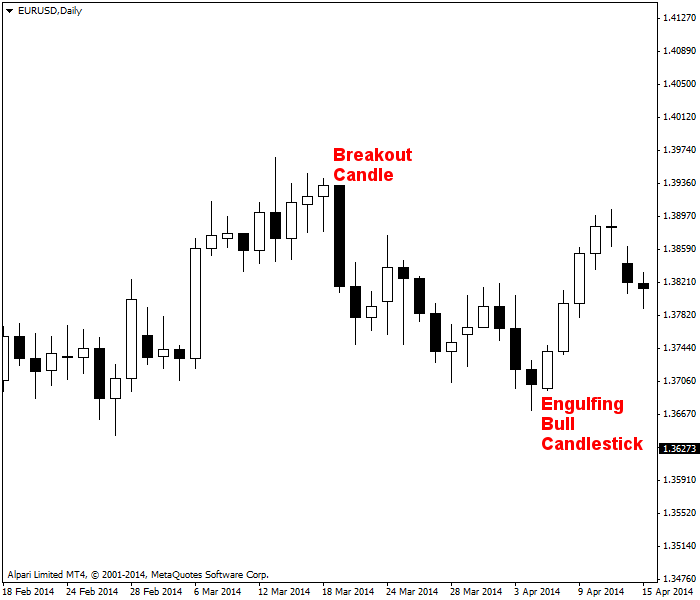 Candlestick chart highlights the relevant patterns. The least easy type of chart to use is the point-and-figure chart. The figure below shows the same data as the other three charts, just reorganized to display net up and down moves. Again, as with the bar chart, you can easily draw support and resistance lines. On this chart, we are not getting a buy signal as from the candlestick charts’ engulfing bull. In fact, this chart features a parallel resistance line and if you are risk averse, you will wait for resistance to get broken before buying. This is an instance in which you would like a point-and-figure chart in a shorter timeframe for practical purposes. Point-and-figure chart offers a totally different version of events. 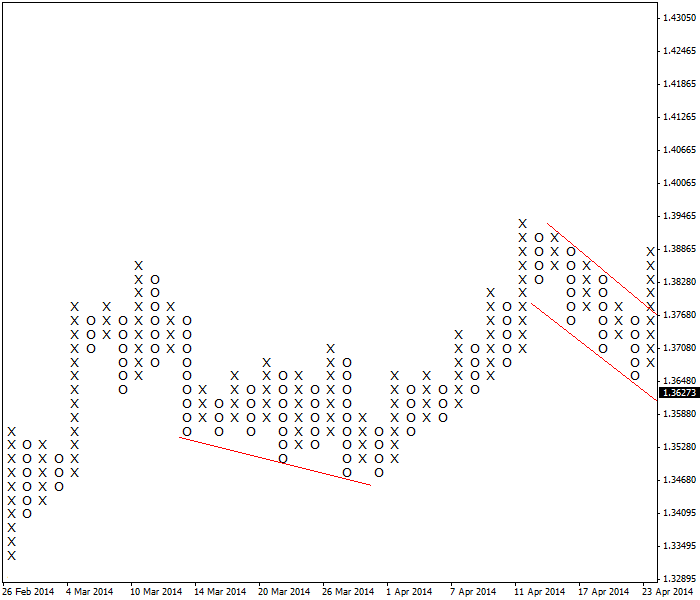 Finally, the Renko chart is a refinement and variation on the point-and-figure chart. A “brick” is put on the chart only if the price has moved in the same direction by a fixed amount. You set the fixed amount and this is very useful if you are measuring a price move as compared to average true range or some other measure. If the price moves by enough to add one brick but not two, you deduce that momentum might still be high and rising, but not rising by enough. On the example chart below, we have a buy signal that we did not get with the point and figure chart on the same timeframe. 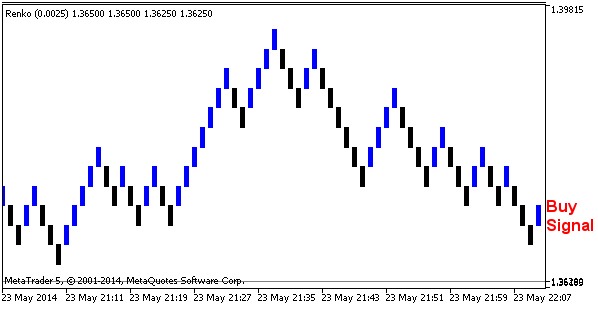 Renko chart provides a buy signal. 1. What chart has the least noise? 2. What type of chart displays the importance of some bars? 3. 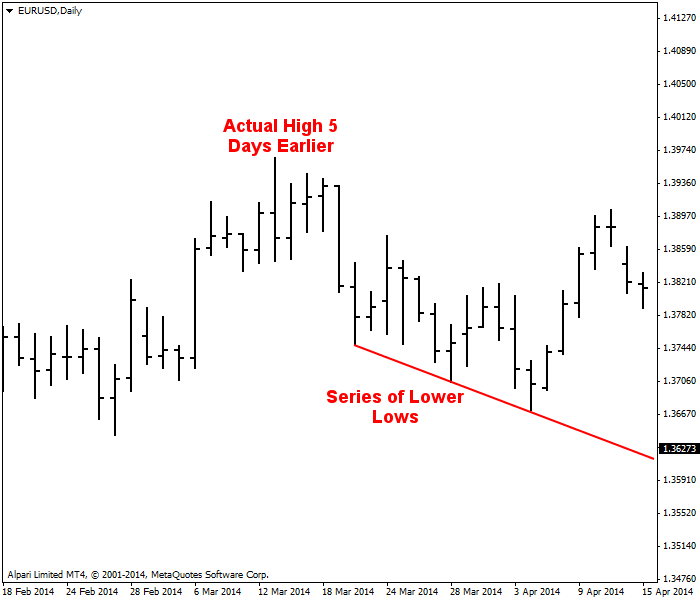 What chart most Forex traders use? Topic 05 - Which Type of Chart Is the Best?